Stephanie Hernandez, 32, was arrested and charged with homicide by vehicle, involuntary manslaughter and other related offenses. 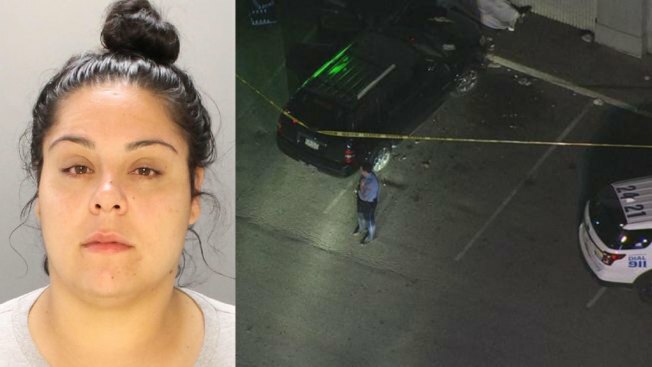 A woman and her teen daughter have both been charged after the girl struck and killed two men in a northeast Philadelphia parking lot while learning how to drive, police said. Stephanie Hernandez, 32, was arrested and charged with homicide by vehicle, involuntary manslaughter and other related offenses. Her 15-year-old daughter is also charged with homicide by vehicle, accident-death-no license and involuntary manslaughter. Police say the teen was driving a 2008 black Ford Explorer back on June 4 around 8:45 p.m. in the parking lot of a shopping center at the intersection of Aramingo and Castor avenues. Hernandez was inside the vehicle with her, police said. As the girl was driving, she lost control and the vehicle lunged forward, striking two men in their 50s who were standing in the parking lot and knocking them into a nearby store wall, according to investigators. A 54-year-old man was pronounced dead at the scene while a 55-year-old man was taken to Hahnemann University Hospital where he was pronounced dead shortly after.